Dr. Mike Topper, president of the American Veterinary Medical Association (AVMA) and official veterinarian of the North Pole, examined the reindeer earlier this month to perform antler-to-tail evaluations of all nine of Santa’s reindeer, making sure they were all up-to-date on their vaccinations, free of disease and healthy enough to make their annual trek around the globe. “As Santa’s personal veterinarian I can say with utmost confidence that all of the reindeer are healthy and ready to bring joy to all the children on Christmas Eve,” Topper said. Topper will make a follow-up trip to the North Pole on Christmas Eve to provide a pre-flight checkup and to inspect the reindeer upon their return on Christmas morning. “They’ll be making millions of rooftop landings throughout the night so we want to make sure they haven’t sustained any damage to their legs or hooves,” Topper said. And because Santa can use all the little helpers he can get, Topper says kids can play a role in ensuring the delivery of presents around the world. While serving as Santa’s official veterinarian is a unique job, Topper’s work is consistent with the role veterinarians play every day to ensure the health of animals, people and the environment around the globe. Far from just being “dog and cat doctors,” veterinarians work with all kinds of species, in all types of environments, to make the world a healthier place for all forms of life. 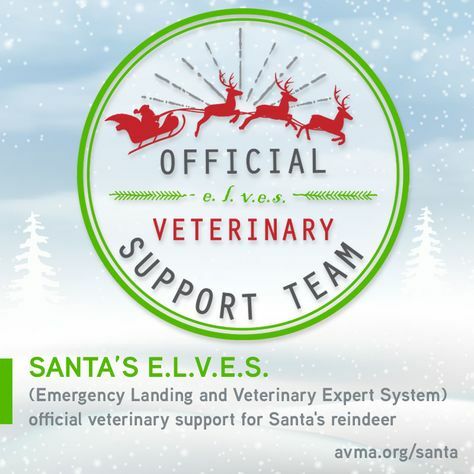 For more information on Topper’s role as official veterinarian of the North Pole, including answers to kids’ questions about reindeer, visit avma.org/Santa.